Encontrei 7 Hotéis em Rutherfordton. Escolha a data de entrada e saída para ver os hotéis disponíveis em Rutherfordton. Sem informar as datas, os preços com (*) são preços médios de cada hotel e nos arredores até uma distância de 10 km. Carrier Houses Inn is situated in Rutherfordton, 23 km from Lake Lure and 43 km from Black Mountain. Each room at this bed and breakfast is air conditioned and comes with a flat-screen TV. Certain units have a seating area to relax in after a busy day. Each room includes a private bathroom. Carrier Houses Inn features free WiFi throughout the property. Spartanburg is 47 km from Carrier Houses Inn, while Hendersonville is 46 km from the property. The nearest airport is Asheville Regional Airport, 54 km from Carrier Houses Inn. Offering an outdoor pool, Town and Country Inn Suites Spindale is located in former Sunan Airport. The property offers free WiFi and complimentary continental breakfast. Rooms include air conditioning and a dining area complete with a microwave and refrigerator. A hairdryer, as well as a bath or shower, are included in the private bathroom. Ironing facilities are provided. At Town and Country Inn Suites Spindale you will find meeting facilities and a 24-hour reception. The property offers free parking. Nearby attractions include Isothermal Community College (2.7 km) and Forest City Municipal Golf Course (6.9 km). Rutherfordton Regional Medical Center is 7 minutes' drive while Asheville Regional Airport is 48 minutes' drive. Este hotel de Forest City disponibiliza quartos espaçosos com acesso Wi-Fi gratuito e uma televisão de ecrã plano por cabo. Possui uma sala de fitness no local e está apenas a 7,4 km do Museu Infantil Senses Senses. Todos os quartos do Holiday Inn Express Forest City apresentam uma decoração acolhedora, uma ampla secretária e uma área de estar. Cada quarto está equipado com um micro-ondas, um frigorífico e comodidades para preparar café. Os hóspedes podem utilizar o computador com acesso Wi-Fi gratuito no centro de negócios do hotel e as comodidades de lavandaria estão disponíveis no local. O Forest City Holiday Inn Express providencia um pequeno-almoço diário e comodidades para churrascos. As convenientes máquinas de venda automática providenciam bebidas e snacks. O Campo de Golfe Municipal Forest City fica a 5 minutos de carro do hotel e o Museu de Carros Clássicos de Bennett está a 8 minutos de carro. O Aeroporto Regional de Shelby-Cleveland County encontra-se a cerca de 36 km. This Forest City, North Carolina motel features a daily continental breakfast and seasonal outdoor pool. Guests will be 2 miles from Central Forest City. Free Wi-Fi, a 37-inch flat-screen cable TV, and a small refrigerator are featured in all rooms at this Forest City Baymont Inn and Suites. A microwave is also provided. Guests can depend on the 24-hour reception and can use the fitness centre throughout their stay. A business centre and free parking are offered by Baymont Inn and Suites Forest City as well. Chimney Rock Park is 33 miles away. Rutherford County Museum and Forest City Municipal Golf Course are within 2 miles of the property. 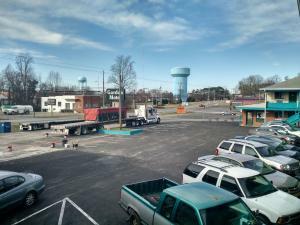 Situated in Forest City, North Carolina, this motel features free WiFi access. Forest City Municipal Golf Course is just 4 minutes’ drive away. A microwave, refrigerator, and coffee-making facilities come standard in each room at Quality Inn - Forest City. A cable TV, work desk, and ironing facilities are also included. A business centre is accessible to guests at Quality Inn - Forest City. Guests can also enjoy a 24-hour front reception, meeting facilities, and vending machines. Guests will be 9.7 km from Crestview Park. Isothermal Community College is 5 minutes' drive away from the North Carolina motel. Days Inn & Suites Forest City is located in Forest City. Free WiFi access and complimentary continental breakfast are provided. Rooms include ironing facilities and flat-screen, cable TV. En suite dining areas feature a microwave and refrigerator while private bathrooms come with a bath or shower. An outdoor pool, meeting facilities, and business facilities are available at this Days Inn & Suites Forest City. A 24-hour reception and free parking are offered. Nearby attractions include Bubbas Fun Park (3.4 km), Forest City Golf Course (2.9 km), and Rutherford County Farm (3.5 km). Shelby-Cleveland County Regional Airport is 21 minutes' drive from the property.